Biodiesel is an alternative fuel for diesel (compression ignition) engines. It is made of renewable, biodegradable materials, e.g. animal fats and vegetable oils. In contrary to petroleum based diesel fuel, biodiesel is biodegradable non-toxic fuel. Its usage reduces emissions of many toxic substances that occur when standard diesel fuel is used. It can be used in almost every engine or device that works on petroleum diesel. What is the biodiesel exactly? Biodiesel is a biofuel manufactured from vegetable oil or animal fat. It is suitable for fueling diesel (compression ignition) engines. Burning biodiesel produces less environmentally harmful substances than burning petrodiesel. Biodiesel is made of three main components: vegetable or animal fat, methanol and catalyst (e.g. KOH – potassium hydroxide). For 1 litre of biodiesel you need a little more than 1 litre of vegetable oil and about 0,1 litre of methanol. To the right you can see a small sample of biodiesel after first washing. 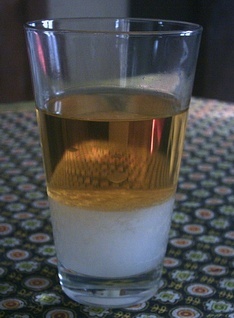 The white layer is the water with dissolved impurities (remains of catalyst, glycerine etc.). Biodiesel can be used as a standalone fuel for most diesel engines. It can also be mixed with petroleum diesel. It is known since 1990-s that biodiesel is corrosive on rubber gaskets and fuel hoses in engines. Biodiesel is better solvent than petroleum diesel. Because of that it shows tendencies to solve all the impurities from gas tank’s inner surface. When you start using biodiesel those impurities may clog your fuel filter. It is important to change them regularly during first few fillups. Biodiesel “freezes” in fuel filter in temperature higher than petroleum diesel does. In some countries biodiesel usage is legally questionable. Biodiesel isn’t the only renewable diesel engine fuel. You can also use vegetable oil, straight or waste.